Choosing and using a new template for your Blogger powered blog can be quite a daunting task. What is the best method for installation? How can you choose the design and layout most suitable for your blog? The Blogger Template Book is a free complete guide to Blogger templates, from choosing the best layout and design to suit your content, to foolproof installation methods and optimization. One look at this woman's gorgeous Blogger blog will tell you she knows what she's talking about. 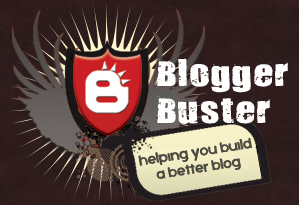 Subscribe to Blogger Buster's feed or emails and you'll have access to the ebook. If you're already a subscriber, check the bottom of your feed posts for a download link. Truth be known, I've been a little jealous lately of those of you who are able to use beautiful, magazine-y Wordpress themes like Thesis. There's no way I'm switching, though. There's way too much involved. 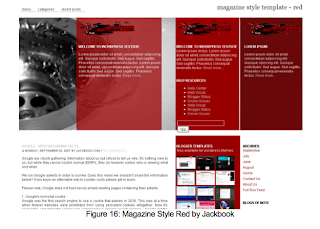 I feel a lot better now that I've found "Magazine Style Template Red" by Jackbook (right, and on page 12 of the book). If Baby Cheapskate gets a new look, you'll know what inspired it! Let's just hope I remember to back up my template first.